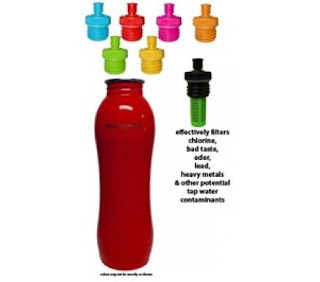 environmentally friendly water bottle with a built in tap water filter or built in advanced water filtration is the best choice for your health and the health of our environment. These groovy little Eco bottles with filters will insure that you will always have safe, filtered drinking water at home or on the go. The Water Geeks Filtered Stainless Bottle with Tap Water Specifications, effectively filters chlorine, lead and other potential tap water contaminants which is great for everyday use and short trips out of the house. It gets even better with the Water Geeks Filtered Stainless Bottle with Advanced Filter Specs which comes with an advanced filter that effectively filters tap water contaminants plus bacteria and other potential ground water contaminants. This little baby makes having safe water while camping an absolute breeze and I wouldn't go to Mexico without one. Using Water Geeks Eco-friendly, stainless steel bottles instead of plastic water bottles will help reduce toxic phthalates in your body and our waterways and reduce plastics in our landfills and the Pacific Ocean Garbage Patch. Using this bottle is one of the greenest things you can do for yourself, those you care about and our planet. I love this kind of water container, it is colorful, so attractive to look at. Not just that, it is eco-friendly too, unlike the plastic one. Hi Bryan, it also fits really well in your hand which is great for carrying it around. I know campers just love it. Thanks for stopping in. This is a good idea. It is fashionable and in the same time, it makes our plastic cups and bottles usage less. I have talked to Thousand Oaks water restoration and they have been also an advocate of using stainless steel mugs. They care for water and all they wanted is to give clean and safe water. Next year, a greener advocacy will be up next.